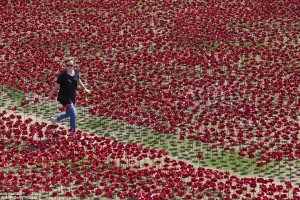 Bright red poppies have become synonymous in the UK by marking the sacrifice given by those who have lost their lives in conflict. Many of us wear a poppy on Armistice Day (November 11th) having made a contribution to military charities to remember this. A stunning display of brilliant red poppies is being installed in the 16-acre moat at the Tower of London to mark the 100th anniversary of the beginning of the First World War. 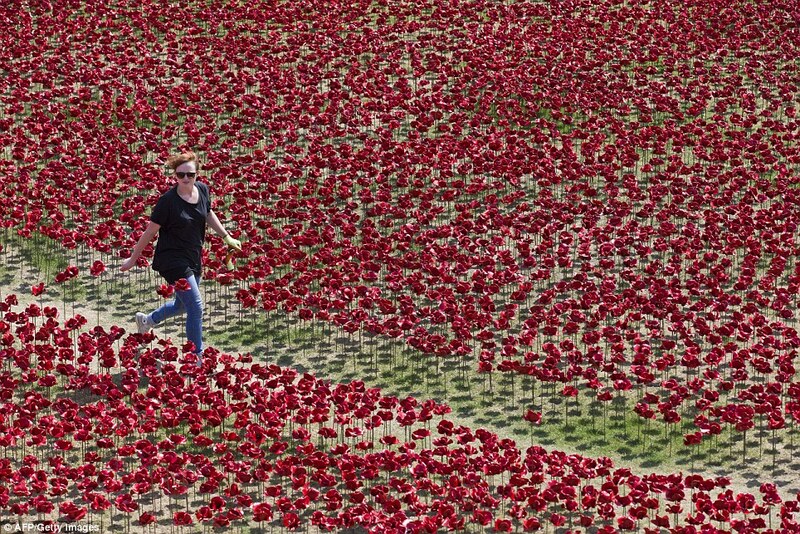 Each poppy represents one of the 888, 246 British and Commonwealth soldiers killed in the conflict. The first poppy was ‘planted’ on the day that the UK took part in the war, and the last poppy will be placed on 11th November this year, filling the moat. 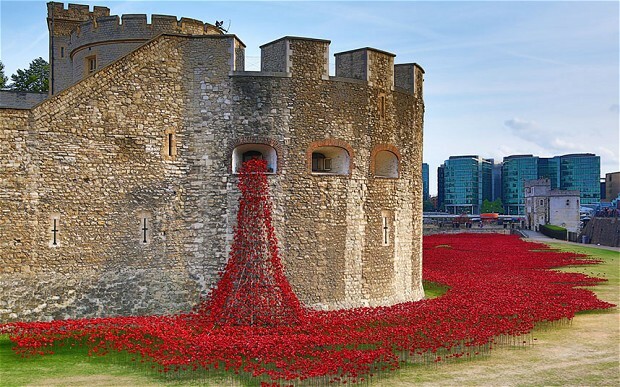 On that day, too, William the Conqueror’s White Tower will be encircled by a sea of red looking like a huge poppy from above, with its round black roof forming the centre. The inspiration for this display came from the poem Blood Swept Lands and Seas of Red written by an anonymous soldier in the First World War, and this was coupled with the idea of creating poppies by the ceramicist Paul Cummins and the inspiration of theatre designer Tom Piper. 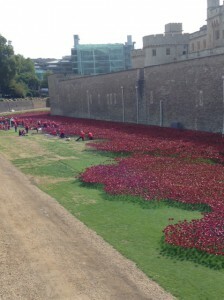 The poppies are made at a warehouse in Derby. Led by Paul Cummins, a team of 52 people are working for 23 hours a day in shifts. The clay has to be cut, rolled to the correct thickness, the petals stamped out by hand using the correct pressure, then assembled and finally shaped into poppies by a team of three skilled craftspeople. The poppies have a central hole cut in the soft clay before they are fired. 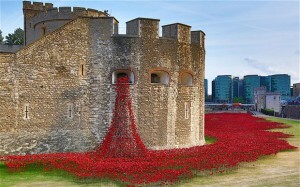 This is how the poppies are made. Once they have been fired and glazed, they are sent to the Tower. 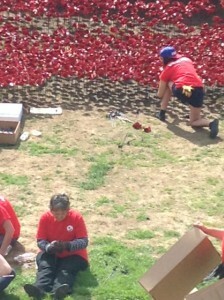 Here teams of volunteers assemble the poppies and plant them. The stalks are individual black metal rods, and washers have to be pushed on to them so that the poppy heads don’t slide down once assembled. 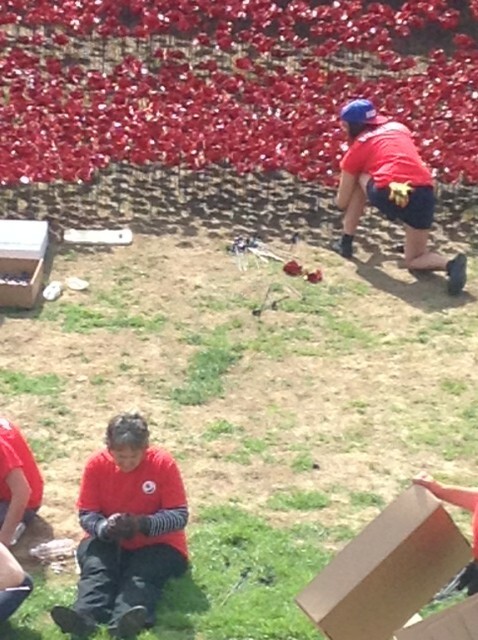 The ceramic poppies are then carefully placed on the top of the stalks, and the round black centre pushed on the top so that the poppies are held securely and they look like the real flowers. 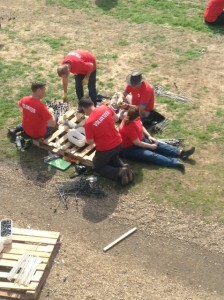 Above: the volunteers are assembling the stalks. Finally the poppies are carefully pushed into the soil of the moat. It is an amazing spectacle, and although it will be dismantled by the end of the year, there will be a lasting legacy. The poppies are being sold for £25 each (to buy, click here), and all the profits will go to military charities. This entry was posted in Blog, Craft and tagged ceramic, Craft, derby, hand-made, Paul Cummins, poppies, pottery, The Blood Swept Lands and Seas of Red, Tom Piper, Tower of London, World War 1 on 31 August 2014 by Patricia.